SPACE VIEW PARK/KENNEDY SPACE CENTER, FL – After a pair of back to back postponements presumably due to technical gremlins, the third time proved to be the charm at last as SpaceX engineers carried out a successful engine test of the Falcon 9 first stage this evening (Mar. 9) atop historic pad 39 at the Kennedy Space Center in Florida. The brief test lasting about 3 seconds took place at 6 p.m. this evening, with an exciting eruption of smoke and ash into the air during the serene waning sunlight as I witnessed from Space View Park in Titusville, FL – which is a great place to watch launches from, offering an unobstructed view across the inland waterway. This critical engine test opens the door to what will be only the second blastoff of the SpaceX commercial Falcon 9 rocket from seaside Launch Complex 39A at NASA’s Kennedy Space Center in Florida. Liftoff of the Falcon 9 carrying the EchoStar 23 telecommunications satellite is now slated for a post midnight spectacle next Tuesday, Mar. 14 from pad 39A at the opening of the launch window at 1:34 a.m. EDT. The two and a half hour launch window closes at 4:04 a.m. EDT. The delayed completion of the static fire test resulted in a two day launch slip from March 12 to March 14 in order to complete all the prelaunch processing. “Following today’s static fire test, SpaceX is targeting the launch of the EchoStar XXIII satellite from Launch Complex 39A (LC-39A) at Kennedy Space Center in Florida on Tuesday, Mar. 14, SpaceX confirmed in a statement soon after completion of the test. The EchoStar 23 launch counts as only the second Falcon 9 ever to blastoff from pad 39A- which SpaceX’s billionaire CEO Elon Musk leased from NASA back in April 2014. The nighttime lunge to space should offer spectacular viewing. But unlike most recent SpaceX missions, this Falcon will be the last expendable first stage. It is not outfitted with landing legs or grid fins to maneuver it back to a touchdown. The planned Mar. 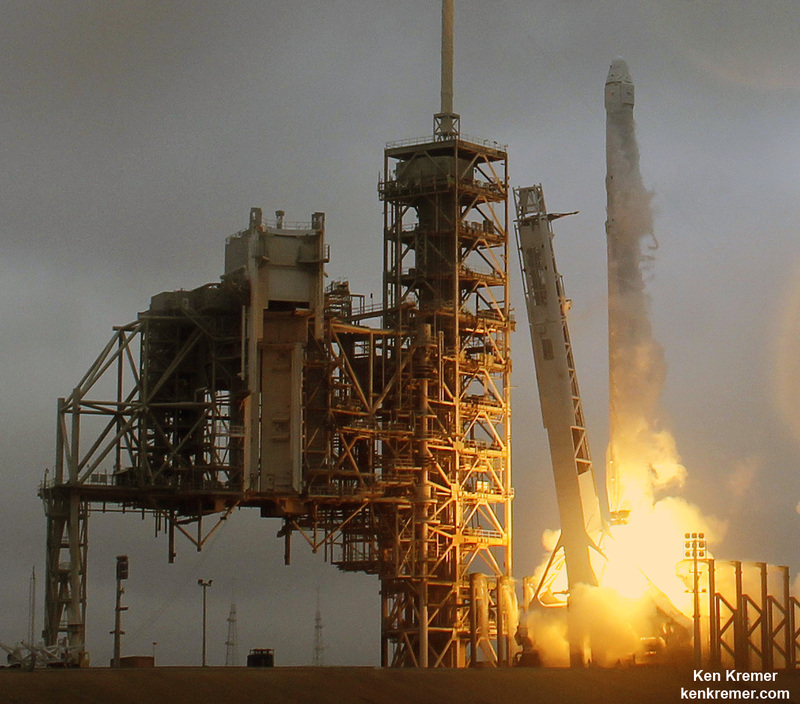 14 launch comes barely three weeks after the Falcon’s successful debut on Feb. 19 on the NASA contracted Dragon CRS-10 mission that delivered over 2.5 tons of cargo to the six person crew living and working aboard the International Space Station (ISS). Launch Complex 39A was repurposed by SpaceX from launching Shuttles to Falcons. It had lain dormant for launches for nearly six years since Space Shuttle Atlantis launched on the final shuttle mission STS 135 in July 2011. Today’s engine test was carried out absent the expensive satellite payload bolted on top, to keep it safely stored away in case of a repeat of the catastrophic Falcon 9/Amos-6 pad explosion last September at pad 40 during a similar test that destroyed both the rocket and payload and caused extensive damage to the pad infrastructure. If all goes well, the EchoStar 23 launch will showcase that SpaceX is picking up the pace of space launches and recovering from the Amos-6 disaster. During today’s static fire test, the rocket’s first and second stages are fueled with liquid oxygen and RP-1 propellants like an actual launch and a simulated countdown is carried out to the point of a brief engine ignition. The hot fire test generated a huge plume of smoke exhausting out the north side of the flame trench of Launch Complex 39A at approximately 6:00 p.m. EST, Mar. 9. at the opening of a 6 hour long test window. The hold down engine test with the erected rocket involved the ignition of all nine Merlin 1D first stage engines generating some 1.7 million pounds of thrust at pad 39A – which has been repurposed from its days as a shuttle launch pad. The Merlin 1D engines fired for about 3 seconds while the two stage rocket was restrained on the pad. The smoke cloud soon dissipated and within 5 minutes there was barely a trace of what we shall soon see next Tuesday – if all goes well with launch processing and the ever changing sunshine state weather. Titusville offers a prime viewing location for anyone interested in traveling to the Florida Space Coast to see this Falcon 9 launch in person. The static fire test is routinely carried out by SpaceX and confirms that both the first stage engines and the rocket are suited for liftoff. The rocket – minus the EchoStar 23 payload – had been rolled out of the SpaceX processing hangar at the perimeter fence several days ago and then up the incline to the top of pad 39A using a newly built dedicated transporter-erector. With the successful completion of the static fire test, the booster will be rolled back to the big processing hangar and EchoStar 23 encapsulated inside the payload fairing will be integrated on top.